A rare, easily accessible ice route, North Peak (12,242’) is a satisfying day’s adventure for the emerging Sierra ice climber. There are three prominent couloirs left of the summit of North Peak, but this route describes the rightmost one, which is technically the easiest, and also the most dependably in condition. 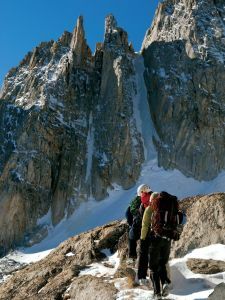 The Northeast Couloir is a coveted snow/ice climb in the Sierra. The just-steep-enough-tobe- fun couloir leads to a short rock scramble that gains the summit with breathtaking views of Mt. Conness and the many surrounding lakes. In the summer, the couloir can usually be found in névé conditions, which many climbers find to be the quickest and most fun condition. In late fall it turns into blue ice, which is more technical. Which SuperTopo guidebooks include a topo for Northeast Couloir? The Northeast Couloir of North Peak.